Communities don’t necessarily trust that you are going to deliver something that will work. That and many more are the challenges of bringing clean water to Cameroon. 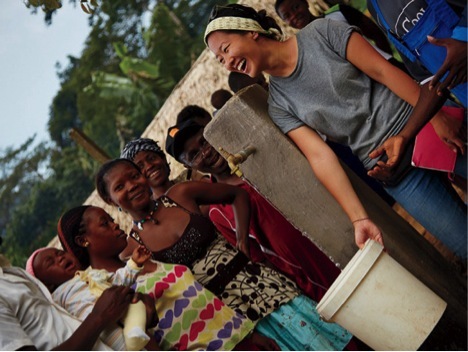 In 2011, when Sophia Sunwoo and Josh Braunstein founded The Water Collective, Cameroon was their first stop for delivering potable water to people in rural villages. Sophia and Josh, from America, first met while working for different projects in Africa. They discussed ideas and decided they were going to start working in Cameroon. They found out close to 50% of the 8.1 million active persons in rural areas in Cameroon do not have access to good portable water. With funds raised from family and friends, they succeeded in delivering their first clean water (tap) to a school in Ekanjoh Bajoh, South West region of Cameroon. Sophia said a chief was so inspired by the idea of clean water that “he gave women of his village extra farmland in exchange for participation in the water management program”. During Sophia’s visit to Cameroon last month, she told us how tough it is to work in rural communities when there is conflict/insecurity. She discussed; she could not travel to the North West region because of the state of insecurity in the Far North region. Sophia also said things get even worse when there is a conflict in the rural community because of the project. “I never thought I would be having trouble with some Bakossi chiefs. Causing a lot of trouble making people dislike and desist from the project," she added. In order to rescue the situation, she is considering hiring a local expert mediator to intercede as project coordinator in these areas to solve problems and enable her to continue with the good work. Water is equally a major challenge for Cameroon's major cities. In densely populated cities like Douala, Yaoundé and Bamenda, with well-developed water catchments, folks spend long hours waiting in queues in water distribution areas to get clean water for their families every day. The taps regularly cease flowing and the inhabitants can go for weeks, sometimes months without clean water. Bamenda, principal town of the North West region, has been suffering from water shortages for the past 3-4 months. Since the Mbatu water catchment facility stopped functioning, there have been serious water issues in the city. Residents have turned to wells, streams and every passing source to get fresh water. Madame Damoujo is a trader at the Bamenda main market. She, like many other women in the town, is happy to see the rainfall for a couple of days. 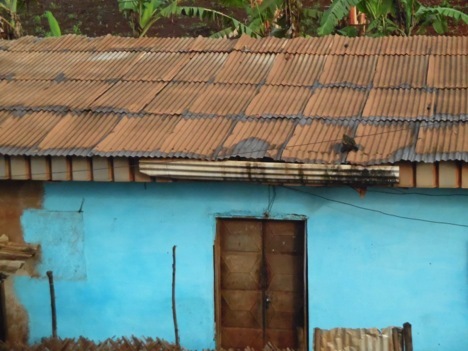 They have developed a fresh water collection system on their rooftops. “I trap water each time it rains, so that my family can drink for two to three days without problems," says Damoujo. However, the Army rescue and the water utilities corporation Camwater have created 30 water emergency distribution points to salvage scarcity. Rooftop water collection systems in Bamenda have developed to gather fresh water from the rains. Reports say that Cameroon will borrow 89.7 Million Euros from France to combat water problems this year. The money is said to finance the supply of potable water in urban areas. If the government succeeds in getting the loan, then the country could be able to satisfy the demands for close to 900,000 cubic metres of water per day in the densely populated urban cities. Read more in fairplanet's dossier on water! Sophia Sunwoo providing water to villagers at the Ebasse community in Cameroon. 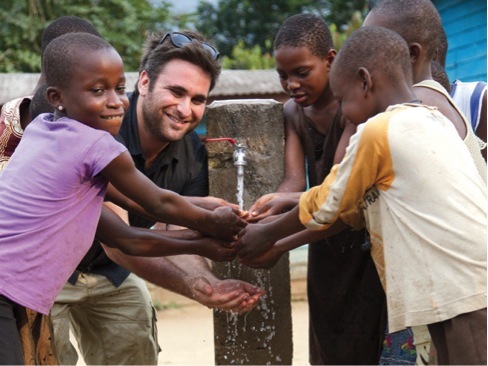 Josh Braunstein enjoys using first clean water (tap) with children in the village of Ekanjoh Bajoh. Rooftop water collection system in Bamenda developed to gather fresh water from the rains.